I was not sure where to put this, so I figured here was as good a place as any. Considering we are all writers here (to some degree--artists of other arts, too), I figured we might all be able to connect on the realm of research for writing. I'm sure some of us will be doing NaNo. Most of us write for our RPs here, and quite a few of us have our own stories we're writing apart (I need to get to work on mine that I posted here to re-write...). That said, research is often times involved in this process, be it researching the lore of supernatural creatures, technology, or time periods. I would like this thread to be used for requests, and answering those requests, for research help. And that said, it need not be limited to fun writing. Many of us have school or other such things that require research, too, and we can always lend each other a hand. That said, I have a request. I am looking for information on domestic violence for my writing, either good fictional stories, non-fiction accounts, the after effects, the psychology--all such things. Any assistance would be wonderful, and from other perspective. Like, the abuser's perspective, the abused perspective, the psychology of the abuser, etc etc. I have a pretty basic understanding of the psychology of the abusers/abused, but it's been some time since I've actively read any research in that particular area, so please forgive me if I'm hazy on a few things. If you'd like me to find the specific peer-reviewed articles that support what I'm saying, let me know and I'll see what I can do about finding them for you. In the mean time, this may be a pretty good resource for a lot of what you're looking for. The abused: from an evolutionary stand point, those abused (typically women) often remain in those damaging relationships because there was a point in time where the 'alpha' male was the most aggressive and powerful of the group, but also the safest choice in terms of sexual reproduction, as they would protect them from outside threats. Naturally this no longer applies in a more advanced and civilized society like ours, but it can be argued that our brains are still hardwired to seek and submit to that 'alpha dominance', as that would give humans the greatest chance of survival. From a more emotional-behavioral stand point, the physical abuse is often tied to emotional abuse as well. Dependency factors determined by lowering the abused sense of worth, i.e. "You're trash" "You're nothing without me" "The only person who could love someone like you is me", conditions the abused into accepting this sort of treatment as the norm while alienating outside possibilities. This effect is made even greater if the abused has a history of abuse, such as a father figure who displayed his 'love' in the forms of physical and emotional abuse, as that would make the victim that much more likely to associate violence with love. The abusers: the most popular understanding of the psychology behind those that would do this sort of harm boils down to the grasping of 'power'. Those who abuse typically take some sort of pleasure or pride at being in a position of dominance over others, though the reason for their pleasure in that role can vary. For some, they have experienced a history of abuse themselves that have left them feeling helpless and weak against their oppressor, so they seek a power that brings 'high self-esteem'. Lashing out against someone weaker than them self gives them that power, raising their self esteem and helps them break the mold of 'worthlessness' that their own abuse beat into them, a very primal satisfaction in their perceived weak self being stronger than someone else, however temporary. Basically, they put someone else down so that they might feel better about themselves. For others, the power is a sense of 'control'. They feel that their life is outside of their grasp, spiraling in a direction they never wanted or feeling trapped in a lifestyle that they hate. The control they rest from the power of abuse, the control over someone else, allows them to relieve that stress and the idea that they're helpless in the machinations of fate. Again, all of this is what I can recall from what little research I did in the past, so some of it may be inaccurate or off-base at this point in time. I was always much more interested in cognitive dissonance and its association with deviant behavior than anything else. I hope that helped a bit. Let me know if there was anything I was unclear on or you'd like me to expand upon. Thank you! Your summary works with a lot of what I'm already familiar with, put in better terms, and it looks like this website has a lot of great sources for me to peruse so I will definitely start on that. If you can dig up some peer-reviewed things, let me know. I still have access to plenty of online journals but as this isn't a typical thing I look up, I haven't done well in my searches. The cycle of violence, children with abusive childhoods growing up to be abusive. The emotional-behavioral constraints abusers condition on the abused. More on conditioning that abusers do to make the abused dependent. The seeking of ‘power’ and ‘control’ by the abusers to compensate for their own weaknesses. More general factors that lead to domestic abuse. More on the effects that could lead to an individual becoming an abuser. It’s translated from Norwegian so the format is odd, but this article in particular is very interesting because it elaborates specifically on external factors in the offender's environment, ie family structure, stress, and social learning. The Duluth Model that I was thinking of when I spoke of power and control. It is the most commonly used model when speaking of or treating domestic abuse, iirc. Edit// Oh, I guess it wouldn't hurt to ask while I'm here. I don't suppose anyone has a wealth of knowledge or easily accessible data bases on Egyptian mythology? I am intimately familiar with Greek and Roman (so different, I know), but I've always been interested in learning more about Egyptian lore. Is there anything in Egyptian mythology you're particularly interested in? When I get home I have some books I can either recommend or peruse for particular bits of information, and I watched a few documentaries on my Netflix that I can get the names of. I can locate other sources--I've been looking into Alqonquian and Egyptian mythology of late anyway. Nothing in particular, no. Frankly, my inability to decide where I want to really begin looking into it is the reason why I haven't already spent hours on wikipedia looking it up, lol. I guess I'd be most interested in the really symbolic tales, like Pandora's Box in Greek or something similar. Creation stories are always interesting as well. I have a rudimentary understanding of their gods, nothing beyond Rah = Sun God and is the rough equivalent to Zeus in terms of hierarchy of the gods. I can certainly provide links to the major stories, and I'll offer summaries besides the links. The two most important stories (from what I understand) are the stories of Ra and his fight every night, and then the story of how Isis put Osiris back together, and thus the birth of Horus. The story of Osiris is here and a longer version is here. Basically, Osiris has an evil brother named Seth who tricks Osiris, thus killing him. Isis, being a powerful goddess and wife of Osiris, enlists the wife of Seth, Nephthys, to find all the pieces of Osiris to put him back together and bring him to life. In some stories, Horus is conceived to Isis before Osiris is returned to life (necrophilia), and in others, after. Either way, Horus is born. Osiris, because he was once dead, becomes Deity of the Afterlife. Horus, as his son, became something of a protector deity (including War, Vengeance, etc. ), because he avenged Osiris. Isis is simply a powerful mother deity. Edit: This is literally today's Happle tea comic: Isis and Horus. Enjoy the humor. On Isis, there are parallels with Demeter, as seen in the longer version of the story when she has a baby burn in a fire so that he may become immortal and such (burning away his mortality). The story of Ra is then here. In general, because of day and night, the Egyptians believed that when it was "night", Ra had gone into the underworld and was doing battle against evil (Apep). His return each day was not guaranteed. Eclipses were thus rather frightening things. Here is some more about Ra in general, as creator god. And here is a bit about my personal favorite, Amon/Amun. He becomes associated with Ra later on in Egyptian lore. The story of Ra is also told a bit in a documentary, which talks of the burial rituals of Egypt. I'll edit when I get home later today with the name of the documentary (My netflix is on my pS3...heh). Sekhmet. The story I was always told was that Bast became Sekhmet when she got a taste of blood, and went into something of a frenzy and began violently killing everything. She was only "relaxed" when one of the other gods managed to get her drunk. This story has Sekhmet as her own deity (scrolling down some), the "Right Eye of Ra" created to deal justice on his behalf. Same idea, she is tricked into getting drunk, etc etc. The Story of Thutmose IV, Pharaoh of Egypt, is here. Something of a "hero" story, though quite different from what we see in Greece and Rome. Thutmose wins the favor of the Sphinx. Isis's Magic is related more here, when Isis heals a child. It also ties into the idea of names having power that we see in other mythologies. Here is a story of the Egyptian view of the afterlife! Most of my books seem to be on this subject, so I can dig up more if it interests ya. If this helps in your research, or sparks ideas of things you want to know more of, I shall provide. This should give you a good introduction into Egyptian mythology and some of the key myths--and then some random ones. Edit: The documentary was the "Egyptian Secrets of the Afterlife". Krystal - this isn't about domestic violence, but rather "abuse". But, if you ever have the chance to read Man's search for Meaning -- http://en.wikipedia.org/wiki/Man%27s_Search_for_Meaning -- truly life changing. Personally this is the most impactful book I have ever read. That book is definitely right up my alley of interests, even if not directly related. I find the stories of WWII concentration camps to be compelling and horrifying. I will definitely be adding this to my Amazon cart soon. That was excellent, thanks! I haven't really had an opportunity to sit down and look at the links yet, but I probably will during my lunch break. It's interesting to me the parallels between Osiris and Uranus being chopped up, even if it was done by a brother and a son respectively. Stress seems to make my mind seek distractions, but this is an old idea (it seems to be bringing up a lot of old things I never finished). I want to write an encyclopedia on supernatural creatures, and I don't mean just any encyclopedia. I mean something far more epic than wikipedia, something like my Dictionary of Angels which lists so many angels and names that the information there is in such a ridiculous proportion that no one ever needs all of it. I have wanted to do this for years because I am constantly failed by all the dictionaries, encyclopedias, etc., that I have access to. It is why I have collected so many over the years. No one just has everything I want, and it isn't sorted the way I want. My ideal one would have the descriptions (alphabetical order), and indexes on how to find things that are winged, humanoid, crustacean, originated in Ireland, originated on the Internet (Slenderman) and things of that nature so that if you are looking for something specific (writing, say, a British horror) you could keep things relevant to the location, or if you just really *need* a horse-monster, bam, you can look it up. My problem right now is 1. how to even *start* and 2. finding lists of supernatural creatures that are more obscure. I particularly need information on South American and Native American creatures, as well as Korea. Korea just evades me. I don't know why. If anyone is willing to lend a hand or point me towards information, you will have all my gratitude. Advice is especially wanted on just the "how to even start" because it is so overwhelming. Also, Australia. Like, lots of Australia stuff. I don't know much of anything. Reminds me of the Dungeons & Dragons monster manual. Would be nice with pictures. Can Satan beat Zeus in hand to hand combat? I appear to be the only one in the world to find plant sacrifice interesting, so I need help. I've been trying for the past three days to find resources on plant sacrifice in Judaism (or basically any non-meat sacrifice, so wine, flour, etc.) because it intrigues me. I had a much easier time when I looked into the Roman Lares, which is strange because of how...small an interest area that is. You'd think Jewish things would be easier to find. No. I've e-mailed three rabbis already to no avail. What I really need is just a resource that points out and explains the times it occurs within the Hebrew Bible, so like, Cain's offering, the First Fruit tithe, and things like that. Once I sort of know all the offerings that occurred, I think I'll be good, but I am not exactly enthused to skim through the entirety of the Hebrew Bible myself. So, if anyone knows of such resources, book or article, I'd be grateful! 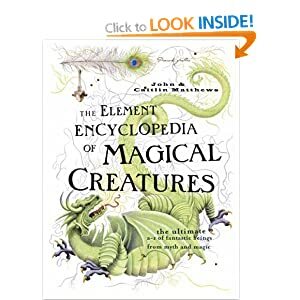 I Have a Mythical Creatures Encyclopedia... somewhere....Buried....I shall seek it out. I have that one ^^; it is useful, just not as useful as I want...obviously or I wouldn't be making an encyclopedia. Did you ever find the stuff you needed, with the plant sacrifice, Krystal? Not that I'm any help - I've actually got a request, hopefully it's easy stuff. Actually it could probably be solved by wikipedia, but I feel like that never describes the nuances of said thing. I can't personally help ya with either, but I can give you a link to a page on Facebook that is for a track team. If you're feeling bold, you could ask them the questions. I've usually had good luck interviewing others, so I'm sure they'll be happy to answer ya! Maybe there's also some details somewhere on the page. As for plant sacrifice...not as much as I'd like. That may just be because there isn't much out there. That's my suspicion. I have no idea why I didn't think of facebook, ughhh I'm an idiot, but thank-you so much Krystal! Lurking now and probably using all my phone data, lmao. That is really, really weird about there not being much info on plant offerings, I mean, we know so much about other weirder things -- but I guess it doesn't have the same macabre attraction human sacrifice does. Did it hinder you with your writing? It did, but it also meant I got to do my own interpretations and prove why animal sacrifice theory is inadequate ^-^ so that was an unexpected bonus.